The Crafty Nurse here with a project using some of the new Essentials by Ellen stamps and dies by Ellen Hutson for our “Texture” challenge here at A Blog Named Hero. A very special thank you to Ellen for allowing us to play with their great product this month. I personally am a “frequent shopper” of Ellen’s which, is a fabulous program that gives discounts to return customers and no one in the business ships faster than Ellen!! 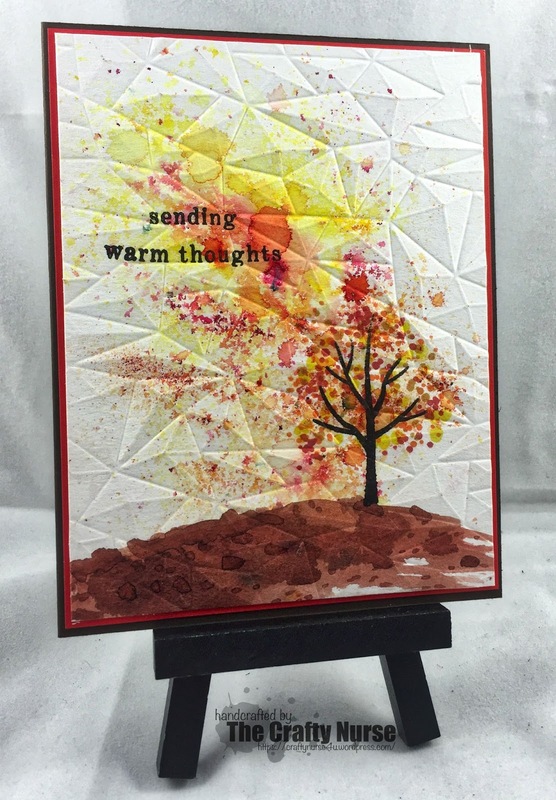 I hope you’ll join us at A Blog Named Hero for our September “Texture” Card Challenge! We look forward to seeing your projects. Hello fellow Hero Art’s Friends! Kathy, The Crafty Nurse here today sharing some inspiration for our “Pop of Color” challenge in collaboration with The Ton. 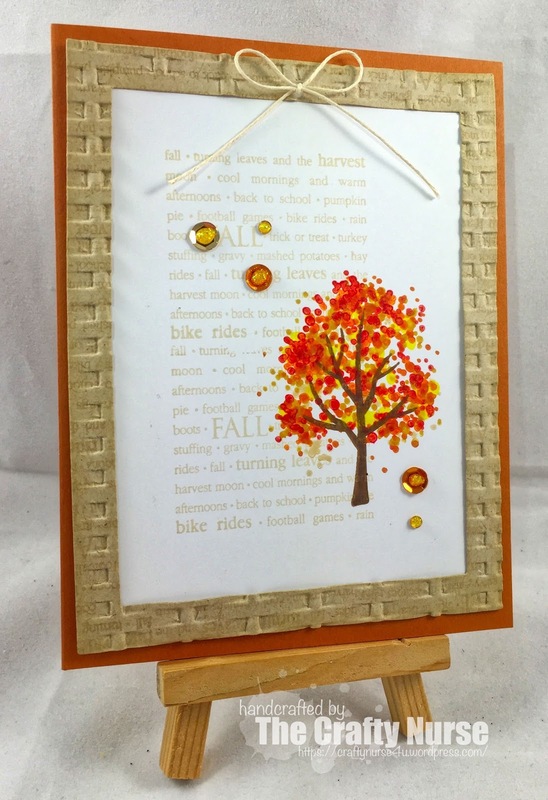 Both cards were made using The Ton’s “Fall Foliage” set. This stunning stamp layering set is so great, I made two cards! The first card is in line with our “pop of color” challenge and features the stamp layering technique from The Ton’s You-Tube video. I personally used a Misti tool to make sure my layers aligned. 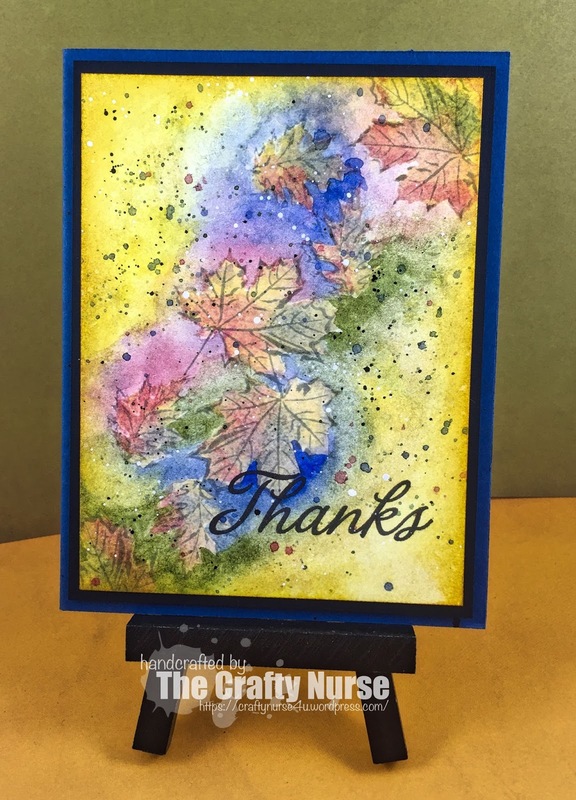 For background leaves, I stamped only the final layer in the leaf set so my focal leaf “popped”. I finished off with an embossing folder over a diffuser for more “pop”. My second card features negative watercoloring taught by Dawn Woleslagle of WPlus 9 in Online Card Classes Intermediate course. I really enjoyed using this gorgeous stamp with this technique. There’s not much time left to enter this months challenge, so be sure to link up your card before 5pm on Monday, August 29th. Happy crafting!! Kathy, The Crafty Nurse here with you today for my take on a this month’s “Pop of Color” challenge going on all month at A Blog Named Hero. This month we are collaborating with The Ton so you’ll definitely want to join. For my “Pop of Color” card today I created a window using rectangle dies allowing for the beautiful Hero Arts florals to peek through. We can’t want to see what you’ve created for your “Pop of Color” over at A Blog Named Hero. Have fun! The Crafty Nurse here with another project using the Fall Color Layering set by Hero Arts for the A Blog Named Hero July “Masculine” challenge. For this card I broke out the Color Bursts using the oranges, reds yellows, and browns scattering them from dark to light. I used the sepia as a watercolor to create a ground then stamped the tree using the Hero Arts fall ink cubes. I stamped the sentiment and then ran the panel through an embossing folder for extra texture. There is only a few days left to enter. We really want to thank Hero Arts for sponsoring this months challenge! Happy inking! Hello! The Crafty Nurse here with some inspiration for the A Blog Named Hero July challenge. This month Hero Arts has stepped up to be our collaborative sponsor for our “Masculine” themed challenge. For those who follow my blog, you’ll know that fall is my favorite season of the year. Now that Hero Arts has put together color layering packages with accompanying ink cube colors, I couldn’t resist Jayne Nelson’s Fall set which includes Pumpkin Pie, Tangerine, Lemon Yellow, and Strawberry. We look forward to seeing your “Masculine” cards this month and I’ll be back later on in the month for another collaborative project with Hero Arts. Please welcome the new Design Team!